Kojima Productions' mascot fully revealed as a... creative skeleton astronaut? Hideo Kojima has finally ended the mystery of the disembodied Skull Knight Man. 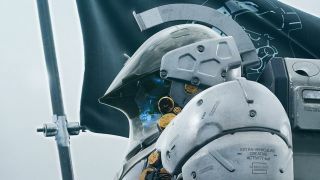 The founder of the newly independent Kojima Productions took to Twitter to reveal the body he'd previously teased (and fans had speculated about) as absent from his studio's mysterious logo. And since this is the creator of Metal Gear we're talking about, you know there's much more to it than just a cool picture. Kojima further explained the idea behind the skeletal explorer in two additional tweets: "LUDENS, the icon of Kojima Productions. We'll deliver THE NEW PLAY in THE NEW FUTURE with the cutting-edge equipment, technology, & the frontier spirit. The gear he's wearing is the extra-vehicular activity (EVA) creative suit." Extra-vehicular activity refers to astronauts operating outside of a spacecraft, at which point they are completely reliant on their suits to survive. Given the glowing blue skull inside that helmet, survival may already be off the table (though on closer inspection the skull itself may be a mask of some kind). So far Kojima has only proffered Ludens as a mascot for Kojima Productions, representing the studio's mission to overcome cultural divisions and enhance humanity through play. Still, that's an awfully detailed render - I wonder if it will also appear in Kojima Productions' first game in some way. After all, the old Kojima Productions logo was just the Fox Unit patch from Metal Gear Solid 3.